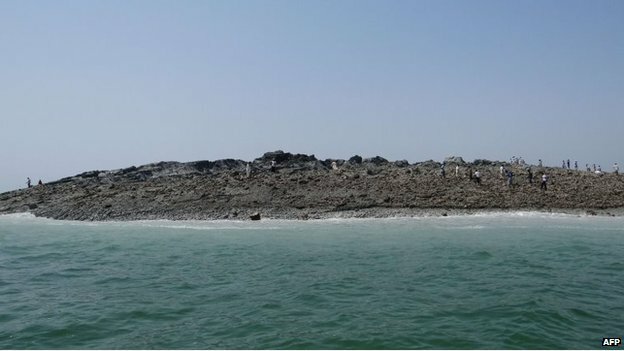 Half an hour after Pakistan was hit by a major earthquake on Tuesday, people of coastal town of Gwadar had another shock when they saw a new island emerge in the sea, just over a mile from the shore. A local journalist, Bahram Baloch, received the news via a text message from a friend. “It said a hill has appeared outside my house,” Bahram Baloch said. Bahram Baloch and some friends landed on the island on Wednesday morning to check it out and to take pictures. “It’s an oval shaped island which is about 250ft to 300ft in length, and about 60 to 70ft above the water,” he said. It has a rough surface, much of which is muddy and some parts are mostly made up of fine- to coarse-grained sand. One part of it is solid rock, and that is where Bahram Baloch and his friends landed. “There were dead fish on the surface. And on one side we could hear the hissing sound of the escaping gas,” he said. Though they couldn’t smell methane, they did put a match to the fissures from where the gas was oozing, and set it on fire. The story now doing the rounds in Gwadar is that a similar hill had jutted out of the sea 60 or 70 years ago, and that the elders had then named it the Zalzala Koh, or the quake hill. They say Tuesday’s earthquake has brought it back. Their story is not entirely incorrect. However the quake hill that appeared in 1945 was not near Gwadar, but over 100km to the east, although it was along the same coastline, which is called the Makran coast. About 430 miles from east to west, the Makran coast is characterized by high seismic activity, and is home to several hills called mud volcanoes, having craters at the top from which methane gas seeps. “The seabed near the Makran coast has vast deposits of gas hydrates, or frozen gas having a large methane content,” he explained.